Post your bench...as it stands! Thread: Post your bench...as it stands! The organization is in the loaded shells XD. Doesn't matter what the production line looks like as long as you know were everything is. About the only thing that stays organized for any length of time is my electronic reference library and electronic notes. I am glad i took that picture. i have been looking for those calipers for three days.... forgot i tossed them on the 308 brass ben while reloading .357 mag. Now there's what a working bench looks like. And believe it or not, I know where EVERYTHING is. I'd excuse a messy bench if your leg wasn't chopped off. Holy moly, man. Thanks! 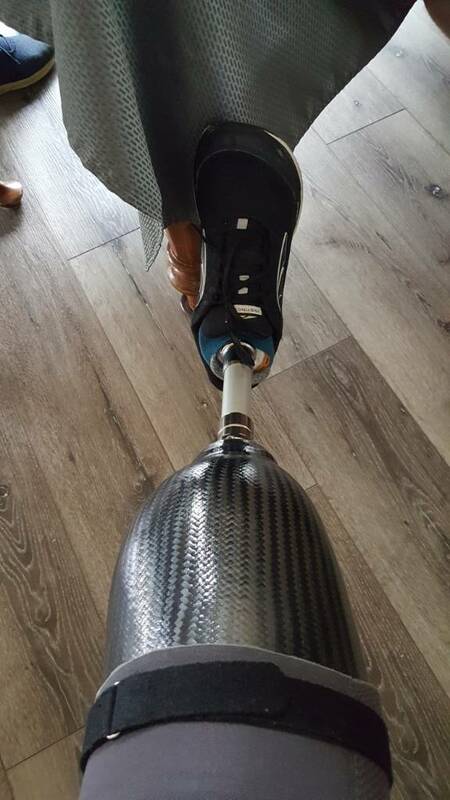 I will show off my new leg! Carbon fiber...hi-tech stuff! LOL! 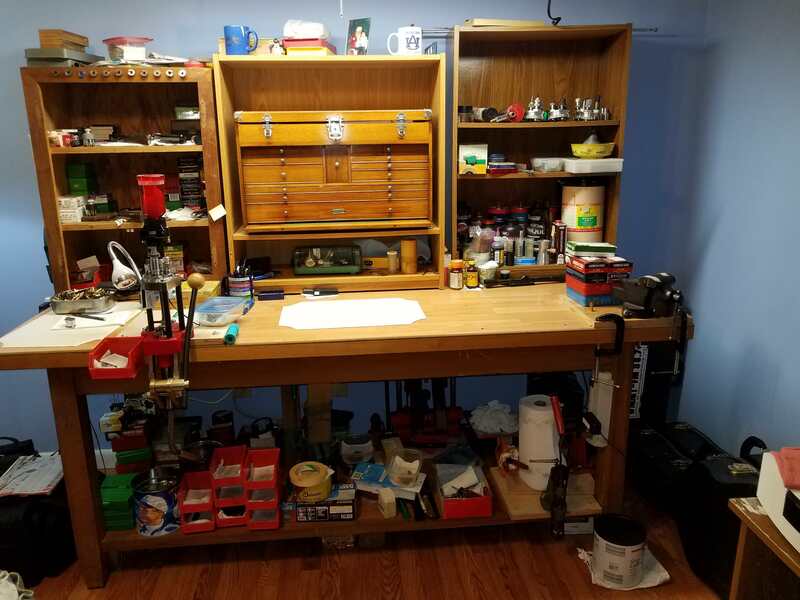 I built my bench when I moved into my house in 1985. It has gone a few modification but it is still the same. I can find what I am looking for in about ten minutes. My bench is 20x48, But im going to make it twice as long. However, thats all the space I can squeeze out. Not counting my casting that I do in my wood shop now. Here is mine from last Saturday, I did move the stool out of the way to get the photo. Bonus, now with more Green Machines! Just finished up 45acp and getting ready for 9mm. I couldn't load in that space; nowhere to lose stuff. Seriously, very nice!! Do you have any of your Green Machines running & do you use them? Edit: I see that you've already commented on that thread. Carry on! You asked for it. The altar where I am at peace. Some of yall's reloading rooms are bigger than my apartment.... and more organized. Call me inspired. Now i want a two story 5 car garage when i grow up. Top floor is for reloading and bottom floor is the workshop. With a side door patio for smelting and a dumb-waiter to haul my lead to the second story. If I did post a pic you guys would cry for me. Well the roof let loose and so did the ceiling over the end of my bench. It is currently holding up a big bucket to catch water and I am currently looking at a 7 day forecast of rain. Got a tarp on the roof at the moment water is not coming in at this point. Oh I wanted to add this. Some of your benches have more items then most of the gun shops in my area. Looks great guys. This pic is a couple years old but not much has changed. There are 3 more presses stored under the benches, I use a home made socket and plate system to mount tools/presses. I've moved all my stuff several times and I tell myself I'll get it organized this time but it never happens. I like checking out all the different ways folks go about doing the same thing, making bullets. Mines more of a slow moving mass. It is so clean at the moment that I’m pretty sure the top is made of wood. This is probably why I like simple hand tools to reload. Don’t some of you folks ever do anything? I know were everthing is. I’m gunna get it all cleaned and cleared away one day. Finally! A bench that looks remarkably close to mine. If you are like me, you know exactly what is on that table and can find it with just a little digging. 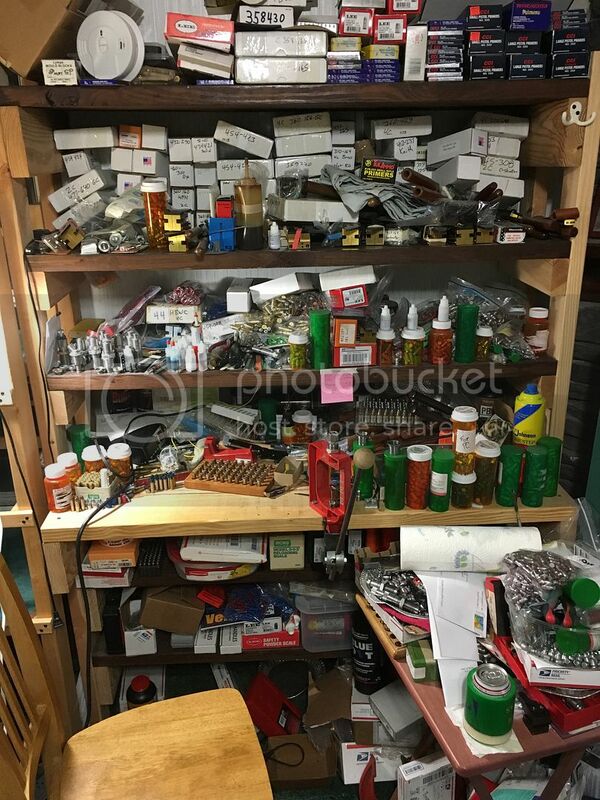 Barrabruce, that is about the raunchiest reloading bench i've ever seen!